You know those people who go on vacation and eat super healthy the whole time they’re gone, never going to any fun restaurants and carefully crafting healthy meals with the microwave, coffee maker, and the minibar fridge in their hotel room? Yeah, I don’t, either. The good news is that I (kind of shockingly) didn’t do a whole lot of damage in terms of the scale–I blame working out with Sara’s trainer, juggling an 11-month-old on the airplane(s), and my work as an pack mule. The bad news is that I ate a lot…like I just started listing all the things I ate and was filled with a tiny bit of self-loathing, so I hit the backspace button, as if that would somehow undo it all, one little click at a time. One night when we were on Leg 1 of our trip (visiting my parents), I made this. It was so delicious and refreshing and healthy that I couldn’t wait to make it again. The salsa sounds a tiny bit weird, but it’s delicious–I mean, if you’re not keen on fruit and meat (I do know that’s a “thing”), this might not be your thing, but it’s so super easy and it’s just feel-good food, especially as we get into the summer months. And…the most miraculous thing of all…both of my older kids love it. Like they eat it without complaining/crying/predicting their imminent death. For the chicken, you’re going to need a pound of boneless skinless chicken breasts, limes, garlic, red wine vinegar, olive oil, salt, and black pepper. Yes, I do realize that I’ve forgotten, like, 52 of the ingredients in the marinade. Can we still be friends? Anyway, rinse the chicken and place in a large Ziploc bag. Whisk together the remaining chicken ingredients in a small mixing bowl and pour it over the chicken. Marinate the chicken for at least 4 hours, no longer than 24 hours. 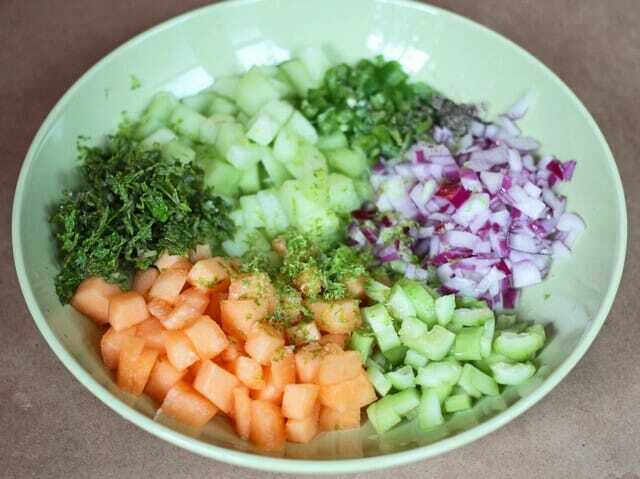 An hour before serving, dice 2/3 cup each of cantaloupe and honeydew, 1/3 cup each of red onion and seeded, peeled cucumber, some chopped mint and seeded jalapeno, the zest and juice of a lime, and some sugar (or honey or agave), salt, and pepper in a small-medium mixing bowl. Stir to combine and refrigerate it until you’re ready to serve the chicken. To cook the chicken, preheat a grill to medium heat. Cook over medium flame/coals for about 7 minutes per side. Remove from the grill and allow to stand 5 minutes before serving. Top with salsa. Makes 4 servings. Super easy feel-good food. Plus, my two older kids love it. So there’s that. 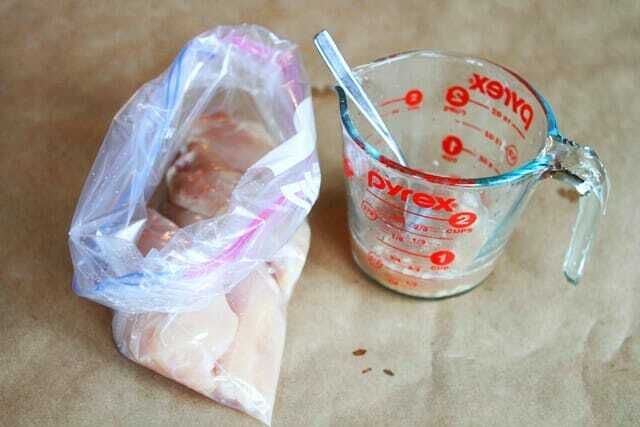 Rinse the chicken and place in a large Ziploc bag. Whisk together the remaining chicken ingredients in a small mixing bowl and pour it over the chicken. Marinate the chicken for at least 4 hours, no longer than 24 hours. An hour before serving, combine the salsa ingredients in a small-medium mixing bowl. To cook the chicken, preheat a grill to medium heat. Cook over medium flame/coals for about 7 minutes per side. Remove from the grill and allow to stand 5 minutes before serving. Top with salsa. This looks delish! 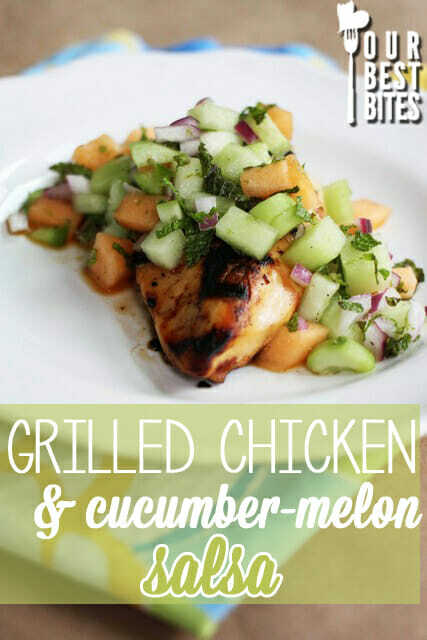 I can’t wait to try it, need a new a go to summer meal! Can’t wait! Love the melon salsa!! This whole dish looks so good! What a simple and yummy looking recipe! I LOVE fruit and Meat so I’ll be making this for sure! (I’ll have to use turkey though because my husband doesn’t like chicken -I know WEIRD right??) Also, where did you get that super cute garlic jar?? Oh yum! What a great looking recipe for Summer! Last night my sisters and I got together and we had a Best Bites Pary! We all made a different recipe, and it was the most amazing dinner. Thanks for all of your wonderful ideas. You rocked it sister! Please keep more of these types of recipes coming – LOVE IT! 🙂 Thanks for all you do! This looks super good, unfortunately I do not like cantaloupe. I will still make it but substitute watermelon for cantaloupe. 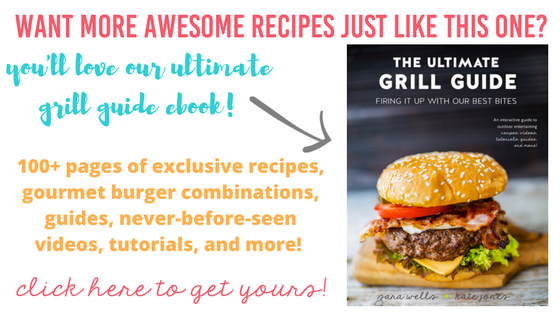 Thanks for the great recipes and great ideas. Looks delicious! You say to make the salsa 1 hour ahead but would it be terrible if you made it the night before? This would be a really quick weeknight meal if I could have the salsa prepped ahead of time…. The only ingredient I am lacking and will have a hard time finding say my small-town grocery store, is the fresh mint. Would it make a huge difference? It looks so goods, and I don’t want to mess it up, but I’m not sure what else I would use the mint for if I bought some. Thanks for always giving me a good smile/laugh! The mint really adds a lot, but don’t kill yourself. 🙂 You might want to check with your friends who have gardens–mint kind of grows like crazy, so many people who have it are dying to get rid of some. Otherwise, you could try a bit of cilantro or even some basil. Guess I know what my new bucket list food item should be. 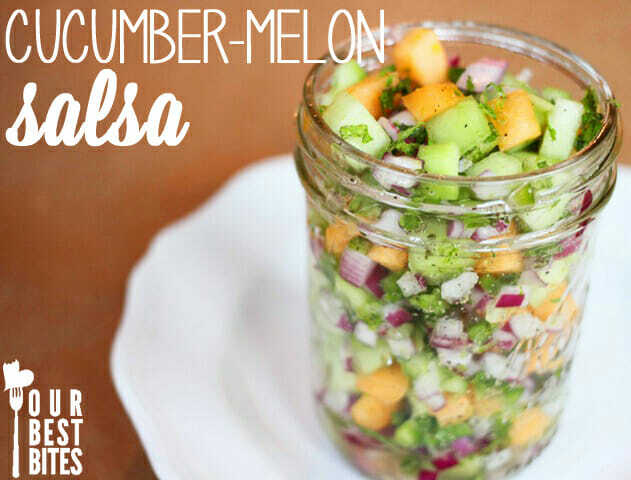 Haven’t tried cucumber melon salsa before but it sounds great! Yes, where did you get your cute little garlic cellar? Wow this looks yummy and easy! Keep up the great work. I made this last night! It was so delicious there were no leftovers! Thank you! Hooray!! So glad to hear it! This looks amazing! Thanks for the laugh about the mini fridge :). I’m in the middle of a move and was just looking at the microwave and mini fridge wondering how long we cold live off of popcorn and yogurt :). I’ll have to try this when we are in a house again. Oh, gosh, that is the WORST–we lived in an extended stay hotel for a little while when we were moving to Louisiana and it was SO hard!! I LOVE your photos. You always make everything look so easy and manageable. The pictures are perfect and this recipe looks divine! Oh, thank you so much, Monica! Do you need the jalapeños? I’m not a fan. Any suggestion on a replacement item or would it be fine to just omit that ingredient? Looks fabulous! However, I’m a vegetarian and detest melon, what would you suggest? Kidding, I made this last night, exactly as written and it was fabulous, thanks so much for the recipe! My kids liked the salsa because it smells like Cafe Rio mint limeade. Actually, I’m lying a little about exactly as written – I only had 1.5 hours to marinate, and it was still good. I’m not saying that’s the way to go, I just want to give hope to the person who realizes they don’t have much time to marinate – you don’t have to go for the chicken nuggets, girl, this is plain yummy. OH MY GOSH, you totally made my day, haha! You would totally be surprised (actually probably not, since you wrote the comment) at how many questions we get like that, haha! I saw that recipe, but I was in the midst of livin’ la vida loca at the time, so I forgot about it, thanks tons for reminding me! Limes are .10 a piece this week, and we’re all drooling over the picture . . .
With a little trepidation because I don’t care for cantaloupe, I fixed this for supper today at my husband’s request. Oh my gosh, it was good! I found myself wishing I’d made more than one chicken breast per person (they were on the small side). I didn’t have any honey dew, so I doubled up on the cantaloupe, but otherwise made it as written. The chicken probably didn’t marinate the full 4 hours, but still turned out well. I want to serve this for a dinner party. Do you have some ideas of what to serve with it? A simple green salad would be a great choice, or maybe some grilled baby potatoes using a similar profile as the chicken. Hope that helps! I made this last night. I loved the chicken. I would definitely use that same marinade again. I was not as fond of the salsa. Maybe I put in too much mint, because the mint taste was overpowering. I tried to use the amount of mint in the recipe, but I don’t think I know how to measure herbs correctly. I recommend taste testing when you add in the mint. ❮ Previous Post Previous post: OBB Scrapbook: Kate’s Visit to Idaho!